The bottom of boats can get wet so wear soft foot wear like trainers that it doesn’t matter getting wet. When near water it is always possible, but unlikely, to get wet so it is wise to bring spare clothes. We are located on the River Thames about midway between Molesey and Sunbury locks on the Middlesex bank some 300 m upstream of Platts Ait; map. We look forward to welcoming you to Aquarius SC. On Saturday 27TH April there is Salzburg Serenade (7:00 for 7:30pm). We will be celebrating the food and music of the Salzkammergut with entertainment from Pat Halling. Including a 3 course Austrian inspired supper and a glass of Schnapps. All for £10. Pay on the night. Come in Alpine or similar costume if possible. Booking by Tuesday 22nd April to email event@aqsc.org.uk is ESSENTIAL. On 31 March conditions were excellent for the start of the new season. As forecast there was E to NE 10 to 15 mph wind. 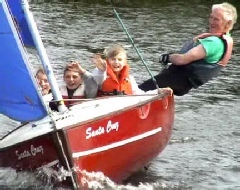 There was excellent challenging sailing; there were 5 capsizes. The sailing is complemented by a lively programme of social events and the bar is open from 19:30 every Wednesday evening throughout the year. On sailing Sundays there is a BBQ and burgers lunch time and tea and cakes at 15:00. We are required by Thames Water to keep the road gate locked; please use the intercom, that is on your right, and some one will fetch you.